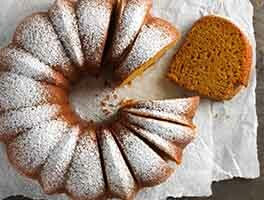 This moist and tasty gingerbread, made with our Gluten-Free Yellow Cake Mix, is delicious served with whipped cream, applesauce, or a combination of whipped cream and a light drizzle of cinnamon cider glaze. 1 hrs 10 mins. to 1 hrs 20 mins. Preheat the oven to 350°F. Grease a 9" x 13" pan, and flour it with gluten-free flour. Whisk together the cake mix, spices, and baking soda. In a separate bowl, beat the butter with half the cake mix/spices. Beat in the molasses, vinegar, and one of the eggs. Add the remaining eggs one at a time, beating well after each addition. Add the buttermilk alternately with the remaining dry mix, one-third of each at a time. Beat until smooth, scraping the bowl after each addition. Bake the gingerbread for 40 to 45 minutes, until it's brown and firm on top. Its internal temperature should be between 210°F and 212°F. Remove the cake from the oven, and cool it on a rack for 15 minutes before slicing. Delicious! I am glad that I decided to try this recipe after failing with a number of GF recipes where I had to create my own version of GF flour. Some times the mixes are just better...especially from King Arthur flour. This is nice and spicy and you can't tell at all that it is GF. I made my own variation of this recipe. I had bought a container of KAF chai spice on sale to experiment with and decided to make this recipe. I replaced the various spices in the mix with 3 healthy tablespoons of the chai spice mix and a small handful of crushed crystallized ginger. (I like spice. A lot.) I changed nothing else about the recipe. I baked it in a 9" x 12" pan and served it without any frosting or icing. It was AMAZING. It smelled divine while baking and came out a beautiful, deep golden brown on top, perfectly risen, super moist, and even more delicious than I'd imagined. My mother, who eats GF, loved it...but she hasn't eaten "real" cake in years. I, however, have eaten flour cake recently -- it's my favorite dessert -- and I was thrilled with the results. Tightly covered, it kept its moist texture and flavor for about 5 days. After that, a few seconds in the microwave revived its heavenly scent and texture. This isn't a GF Cake; it's a cake that happens to be GF. I immediately made a second cake for my group of college students, some of whom are GF. Everyone loved it. It was extremely popular, with even the "I don't like sweets" students going back for seconds. My coworkers, none of whom eat gluten-free, all raved about it and polished off more than half a cake in a matter of hours. A couple of notes: I beat the batter for a veeeeery long time as I lost my splash guard in my last move and I had to spoon the light "flour" mix into the mixer, a teaspoon at a time. I would cringe at beating a wheat flour cake like that, but it works well for the GF mix. I used a little of the cake mix/spice mixture to "flour" the pan. This gives it a little bit of a crunch and a slightly sharper spice flavor on the edges. I liked this as did most of the people who ate it; a few who preferred a lighter spice brushed it off. I really cannot say enough good things about the King Arthur gluten-free yellow cake mix. I've made a couple of variations on the cake and all have them been enthusiastically received by everyone, regardless of their dietary preferences and needs. It's great to have a reliable resource for baking that lets me get creative and riff without fear it'll be an expensive dud. This year, my group of students included two gluten-free students (one was celiac who had avoid even a whiff of cross-contamination), one with particular nut allergies, one with lactose issues, one who disliked chocolate, several who eschewed sweets, and one who was allergic to strawberries. I tried buying treats (specialty cupcakes and ruinously expensive flourless bakery cakes), but they met with little success as even when delicious, they were too sweet. Trying to find something I could make to celebrate their birthdays together, with nobody feeling singled out as "different," was difficult. Thank you, KAF, for helping me rise to the challenge! This is delicious! Even Dairy Free! I couldn't find the King Arthurs mix at my store so I used another brand which was only about 17 ounces. I used 4 medium eggs instead of large. About 1 TBSP less Molasses. I did use the full Tablespoon of vinegar and 6 TBSP of Earth Balance margarine. For the milk, I subbed 1/2 C. Almond milk with a TBSP of Cashew Yogurt. I didn't have enough powdered ginger so I grated some fresh and I highly recommend it! For the finishing touch, I glazed it with real Maple Glaze and sprinkled diced, candied ginger on top. I will look around for the King Arthurs mix because I think it would be even better if I weren't guessing on all the amounts. Amazing Holiday Treat! Excellent! I love gingerbread, but wanted to make my own so that I was sure it was gluten free. 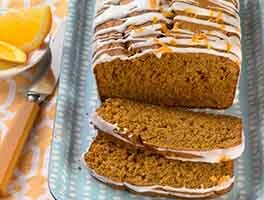 This recipe was awesome and I was amazed that it tasted even better than the gingerbread sold at our favorite bakery. GREAT RECIPE! ! ! WI'll be ordering more cake mix to use for the holidays. I'm in the process of baking the cake right now so can't give a rating yet, but wanted to point out something in the recipe. In the Directions, step 1 states to "Grease and FLOUR a 9x13 pan". Perhaps it would be good to point out that you should not use wheat-based flour for doing this. I greased and floured the pan, but luckily caught that before putting the batter into it. My friend coming for dinner tonight has celiac disease and is extremely sensitive to any wheat. I used a small amount of the cake/spice mix to "flour" the pan - after washing it out thoroughly! This turned out tasty, but mine came out a lighter color and more cake like than the gingerbread I am familiar with. 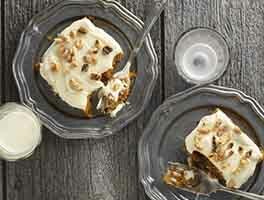 What type of molasses are used fot the recipe? I used a lighter molasses so I suspect that is why I didn't get the dark color. This cake was delicious and reminded me of the Martha Washington gingerbread I made from a little blue box as a kid (which you can no longer buy - boo!). 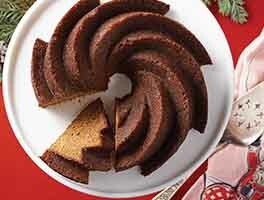 Although this cake is not as dark as a regular gingerbread cake, the flavor is spot on. I'd serve this to everyone - not just GF eaters, as the texture was exactly like a wheat-based cake - soft and tender but stays together and is not gummy. Delicious. 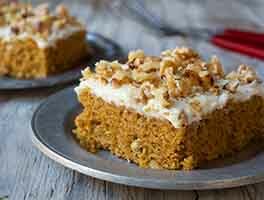 This will be my go-to recipe when I need a gingerbread fix! I am never disappointed in King Arthur's GF recipes! Excellent recipe. I just wanted to share that I made this and baked it in the Nordic Ware Cozy Village Cake Pan. I was able to make 9 small gingerbread houses for decorating (about the size of a 1 1/2 cupcake). I probably could have made 10 total if I didn't over fill the pan. I substituted coconut milk for the buttermilk and coconut oil for the butter, to make it dairy free. This is the best gingerbread cake I've tasted. This was easy to put together and the taste and texture were perfect. The only change I made was to add some finely dices crystallized ginger to the mix just because I had some in the pantry. No one knew these were gluten free. The King Arthur gluten-free products are far superior to the others on the market for both taste and texture.